The most interesting people ride bikes. Mike Wilkinson encountered a bike-riding homeless man who calls himself Todd the Volunteer, and asked if he could share the man’s story. Driving along Chapman Avenue in Garden Grove, in the distance I saw the silhouette of a man in the middle of the expansive street. As I approached, I realized he was sweeping up debris from the recent rains. I noticed his bike with a trailer and huge orange sign on the side of the road. Then, in a second, he was in my rear view mirror. Finishing my errand, I remembered how my wife and I had agreed that we would want to help a homeless person who is doing something productive. I couldn’t forget this guy, so I resolved to find him on my way home. His bright orange sign made that easy. Todd the Volunteer introduced himself as I handed him a five dollar bill. He posed for some pictures and told me he had recently cleaned several freeway underpasses from top to bottom. He was friendly and articulate. His energy and appearance was far from the stereotype of a homeless person with mental issues, addictions and poor hygiene. He lives in a local park, and he is a busy guy. He has a Go Fund Me page, and there is a You Tube video about him. KNBC Los Angeles did a piece on him. He told me “I believe that if I help the community, the community will help me.” Last year the Orange County Register named him one of its 100 most influencial people. Now I know why. You also experience the world on a bike in a way you never would zooming by in a car. 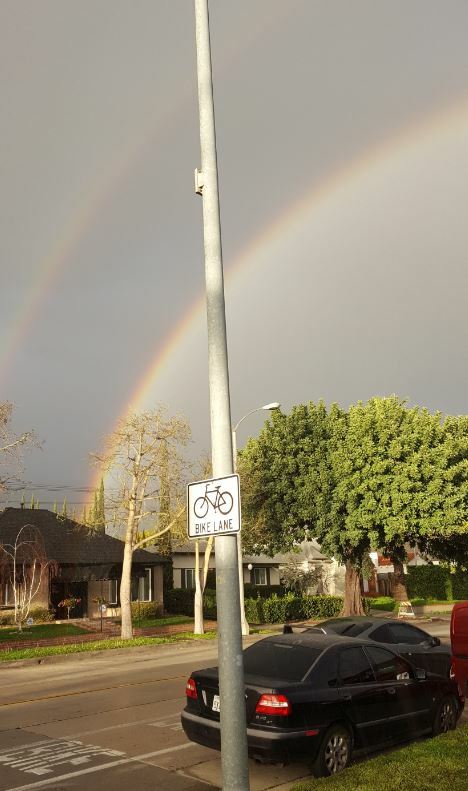 Like the double rainbow Sam Kurutz captured as he rode home Wednesday night. 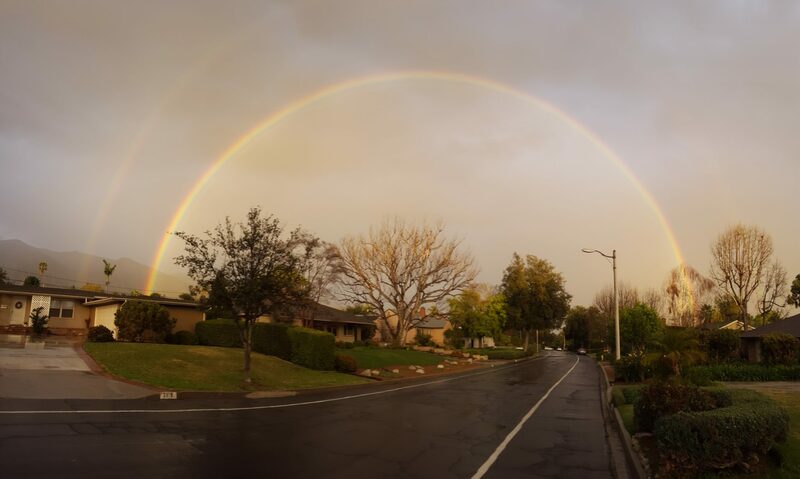 A big cloudburst took place in Pasadena/Sierra Madre last night and produced a beautiful rainbow. I got soaked except for my chamois, by some miracle. Anyways… it was a tricky ride home because drivers were looking at the rainbow and not for a cyclist, so I had to be really cautious. More political news leading up to next month’s local elections. Bike the Vote LA endorses Krystal Padley for Pasadena’s 5th city council district. Walk Bike Burbank offers responses to their candidate survey from the people running for Burbank City Council. And the LA Times provides a recap of their endorsements; they got it right on Joe Bray-Ali and Measure S, but missed the mark in endorsing career politician Paul Koretz over challenger Jesse Creed. As Erik Griswold points out, you really don’t want to read the comments on the San Diego U-T’s story about the proposed California Idaho Stop bill. But you probably will. And you’ll regret it. A British pro calls for a ban on disk brakes after he claims one cut through his shoe at the Abu Dhabi Tour. Or maybe not, unless his shoes are made out of cardboard. The Electric Bike Expo starting in Long Beach this afternoon makes LAist’s list of 20 of the coolest things to do in Los Angeles this weekend. San Diego officials are accused of not taking Vision Zero seriously, saying zero traffic deaths is a nice goal, but “we know we won’t be able to meet that.” Nice lack of commitment there, guys. San Francisco discusses possible safety improvements on 17th Street, where several riders have been injured after catching their tires in streetcar tracks. The Napa Valley Register says tourist-designed bikeshare is coming to the area, but doesn’t bother to explain what the hell that means. The mayor of Redding wants you to try riding the area’s trails as part of their Mountain Bike Challenge. The Portland city council voted to overturn a decision by the city’s Police Bureau to exonerate an officer for using a Taser on a bike rider not once, not twice, but six times — three after he was already on his stomach with two officers on his back. Michigan considers requiring drivers to give bike riders a five-foot passing distance, as well as proposing that all driver education classes include an hour on how to share the road with vulnerable users. Boston’s mayor promises to make the city safer for people of all ages to walk, bike or drive, in part by reducing speed limits to 25 mph. Never mind walking in Memphis. PeopleForBikes is looking to make historic South Memphis a comfortable place to ride a bike in as part of their Big Jump Project. Bicyclists in Shreveport LA complain that a proposed bike path network doesn’t go where people want to go and won’t encourage new riders. The best way to ensure any bikeway will fail is to put it where city officials want it go, rather than where people want to ride. Bike Radar offers five suggestions for things you can do behind the wheel to make the streets safer for bicyclists. They forgot to mention put down your damn phone, take your foot off the gas, and pay attention. Saskatoon cyclists ask the city to change a number of bylaws that limit bike safety and the practicality of bicycling in the Canadian city, including a ban on carrying loads and a requirement to dismount and walk when passing pedestrians on bridges. A Toronto teenager got a $350 fine and three points against his driver’s license for running a red light on his bicycle, even though that’s not supposed to happen. Bicycling violations aren’t supposed to count against your license in California, either. So if you get a ticket, make sure the officer marks on it that you were on a bike, not in a car. Heartbreaking story of an Afghan journalist who fled on a rickety bicycle to seek asylum in Canada — not from the people back home who wanted to kill him, but from the political turmoil and anti-Muslim attitudes in the US. London’s new mayor has come out in favor of three of the city’s Mini Holland bikeways in the face of a 6,000 signature petition from motorists demanding their removal. That viral video of a Brit bike rider ripping the mirror off the van of a driver who harassed her has been taken down after it was proven to be fake. Caught on video: A British bike thief tries, and fails, to cut through a lock and steal a bicycle. Irish cyclists protest in front of the legislature demanding that 10% of the country’s transportation budget be set aside to promote bicycling and protect riders. An unlicensed hit-and-run driver who killed an Irish bicyclist had his sentence increased by nine months after prosecutors appealed his original two and a half year sentence. He was also banned from driving for 15 years, although that didn’t seem to stop him before. Move to France and get 200 euros — $212 — towards the purchase of a pedal-assist ebike. A female rickshaw driver is breaking gender rules in Bangladesh. Thanks to Megan Lynch for the heads-up. An 18-year old Malaysian youth is under arrest for a Facebook post calling for the public to come together and meet with the sultan in charge of the state where eight teenage bike riders were killed in a collision. Let that be a reminder not to take the freedom of speech and assembly we enjoy in here the US for granted. You can carry anything on your bike, even a dead deer. Who needs a speed gun when you’ve got a hi-viz vest and a blow dryer? And if you’re the ethics chairman of county bar association, maybe you should consider the ethics of not driving distract and under the influence. 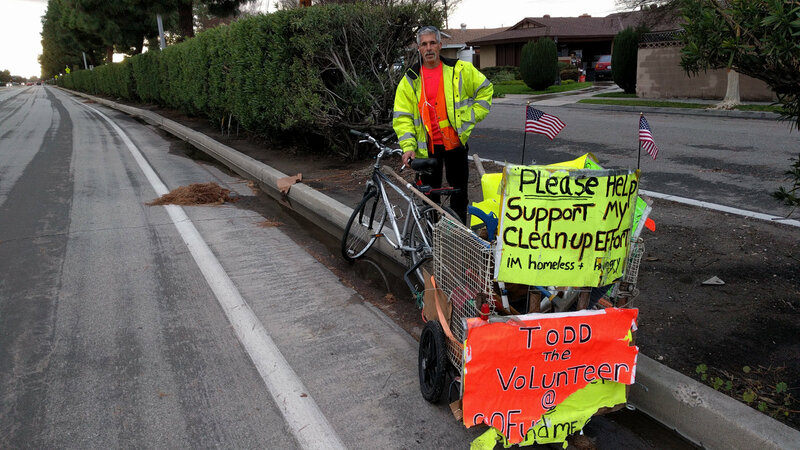 Todd the Volunteer… Bravo, reminds me of a program I read about where an organization goes out and hires several homeless folks to do just that, cleaning up areas around on/off-ramps & pays them $40-50. It’s a win-win.